HYDERABAD: Standing 38 ranks below India’s top B Tech school — the Indian Institute of Technology, Madras — Hyderabad’s International Institute of Information Technology (IIIT-H) has recorded higher median salaries for its graduates during the 2017-18 placement season. This has been revealed by the National Institutional Ranking Framework (NIRF) in its report released on April 9. While graduates from IITMadras bagged a median salary of Rs 13.06 lakh, it was at least four lakh higher — Rs 20.35 lakh — for students passing out of IIIT-H. Median salary is the statistical middle figure which is arrived at after all students’ offers are ranked in an increasing order. 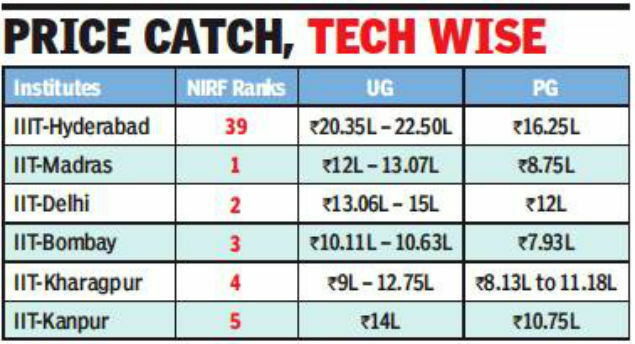 The NIRF report shows that median salaries of graduates from all top IITs, including Bombay, Delhi, Kharagpur and Kanpur, lags far behind that of IIIT BTech graduates who have seen a significant jump in average pay packages — from Rs 10.30 lakh to Rs 23.55 lakh — over the last five years. Experts and IIT authorities, offer another explanation. While lauding IIIT’s focus on research, they say that it is the institute’s course structure that makes the difference in median salaries. It offers engineering degrees only in computer science. In an e-mail response to TOI, Bhaskar Ramamurti, director, IIT-Madras too made a similar observation and stressed the need for a disciplinewise analysis. “We are not comparing similar cohorts here. We need to look at this discipline-wise. The IIIT is likely to have mostly CSE graduates,” Ramamurti wrote.